Should I cross the road now ? Last week, I was lucky to have captured this image live. This is about a traffic signal: Not the movie, this is about the signalling device used to control traffic. On one of the main roads near my residence, the traffic signal displayed one of the rare-to-be-seen visuals. As seen in the image, this seems to be a signal to guide the pedestrian. I would expect only one image to be displayed at this traffic signal. I was waiting at the other end of the traffic light and waiting for it to turn 'Green'. And I was surprised at what I saw for the next 128 seconds. 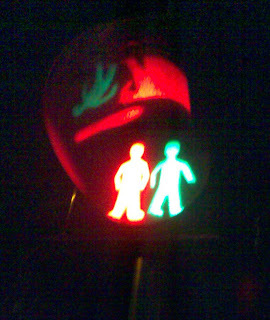 Both the 'Red Pedestrian' and the 'Green Pedestrian' images were displayed simultaneously next to each other. Then it turned to 'Green' image for few seconds and alternated between the 'Green' and 'Red' image after a set time interval. After a week long observation, I could not see this visual again. Even after observing the signal continuously for 11 hours (10am - 9pm), the same scenario was not displayed. My question to all the readers and their friends: How costly is it to miss this bug? First of all, do you agree that it(display of two images simulataneously) is a bug? Was this Race Condition not covered during testing? Was this risk too costly to be avoided in the first place? Was this risk covered and yet not fixed? I support ETI Finishing School... Do you? The ‘Hands on software testing training’ has brought in a bold change. Are you brave enough to appreciate these ‘testers’? Do you still believe that ‘training through slides’ is better than ‘hands on training’? Don’t you think we need to support this unique school of software testing? How Can I support this initiative? Friends, There is never a wrong time to do the right thing!!! Who knows, few years down the lane, this may be the turning point in the history of software testing. Be proud to extend your full-fledged support.